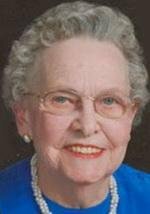 WATERLOO - Grace M. Akerson, 93, of Waterloo, died Monday, Oct. 7, 2013, at Covenant Medical Center of natural causes. She was born Aug. 28, 1920, in Dyersville, daughter of John and Ella Hittenmiller Klassen. She married Allen G. Akerson on Dec. 31, 1941, in Cheyenne, Wyo. ; he died June 21, 1983. Mrs. Akerson graduated from Dyersville in 1938 and from college in Dubuque. She taught school in Dyersville, and at St. Mary’s and Sacred Heart Schools in Waterloo. She was a member of St. Edward Catholic Church. Survived by two sons, John (Mary Ellen) of Raymond and Arthur (Georjanne) of Waterloo; two daughters, Alyce Esposito of Colorado Springs, Colo., and Jean (Tony) Peters of Waterloo; 14 grandchildren; 29 great-grandchildren; and a sister, Kathleen Hageman of Dubuque. Preceded in death by three daughters, Mary Ann Jennings, and twins, Elaine and Marie Akerson; a son, James; a sister, Margaret Smith; a brother in-law, Joseph Hageman; and a grandson. Services: 10:30 a.m. Thursday at St. Edward Catholic Church, with burial in Waterloo Cemetery. Visitation from 5 to 7 p.m. Wednesday at Locke Funeral Home.